The man who’s taught the world the meaning of humility: He lives in a B&B and makes sandwiches for his guards. 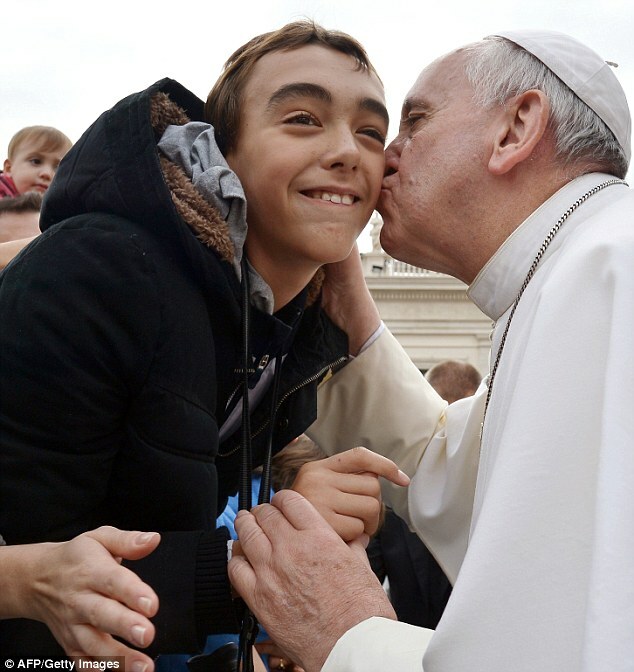 Could Francis be the greatest Pope ever? Question: Who was the most talked about person in the world this year? Answer: Not Justin Bieber, Prince George or even Nelson Mandela, but a small, grey-haired man from Argentina called Jorge Mario Bergoglio. 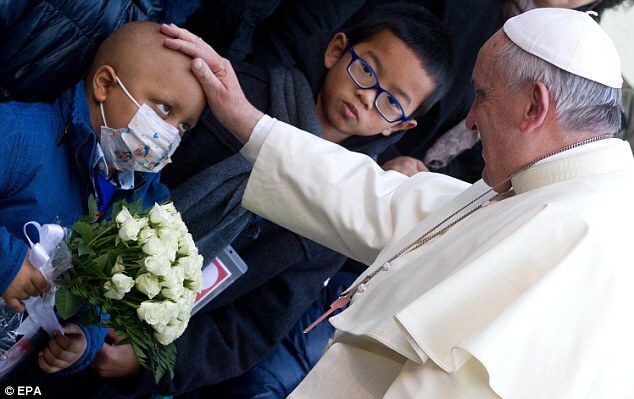 Known since March 13 as Pope Francis, the spectacle-wearing 77-year-old was 2013’s most discussed human being, according to the Global Language Monitor’s annual survey of the internet. The accolade lays bare his astounding ability — unique among modern religious leaders — to shape the news agenda and capture hearts and minds with a succession of charismatic speeches and colourful public gestures. 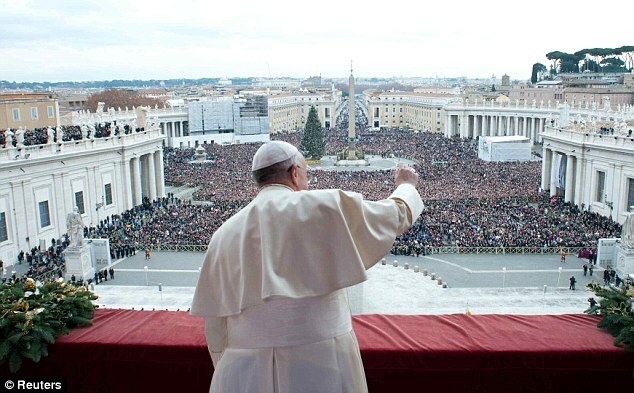 Yesterday, Francis drew a near record crowd estimated at 100,000 to St Peter’s Square in Rome to hear a Christmas address where he called for ‘a better world, free from conflict’. 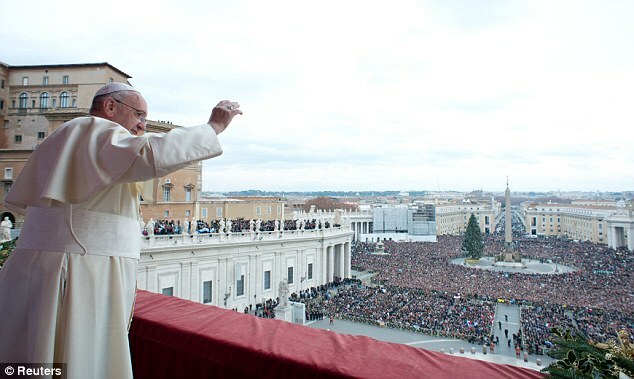 More than two million people have flocked to such audiences since his election — four times the number his predecessor Pope Benedict drew in total in 2012. 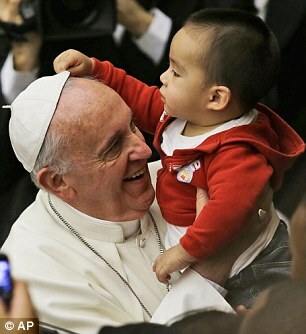 This Pope’s headline-grabbing speeches are tweeted and televised around the world. His public gestures are YouTube gold. And his policy statements are included in the morning briefing papers of Barack Obama, Vladimir Putin and David Cameron. A fortnight ago, Francis was named Time magazine’s 86th Person of the Year — an honour previously awarded to Churchill, the Queen, Ronald Reagan and John F. Kennedy. In just nine months, the magazine credited him with single-handedly re-vitalising a Roman Catholic Church that has been mired in scandal and long-term decline. ‘Rarely has a new player on the world stage captured so much attention so quickly — young and old, faithful and cynical,’ it wrote. 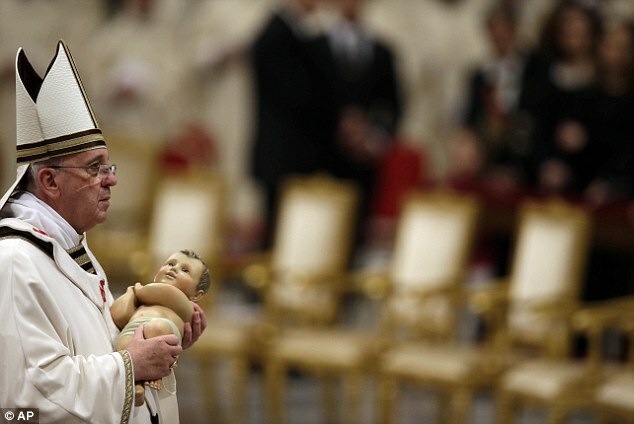 The answer was neatly illustrated by his arrival at St Peter’s Basilica in Rome late on Christmas Eve. 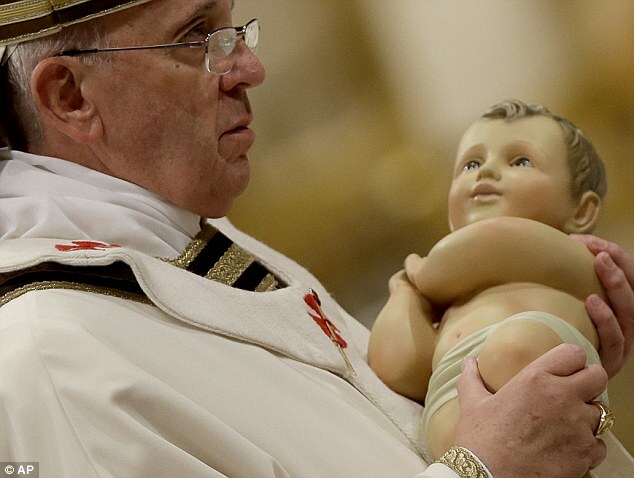 Traditionally, popes attend the evening Mass with a retinue of aides and flunkeys, one of whom carries a statue of the new-born Jesus. However, Francis had no such entourage. 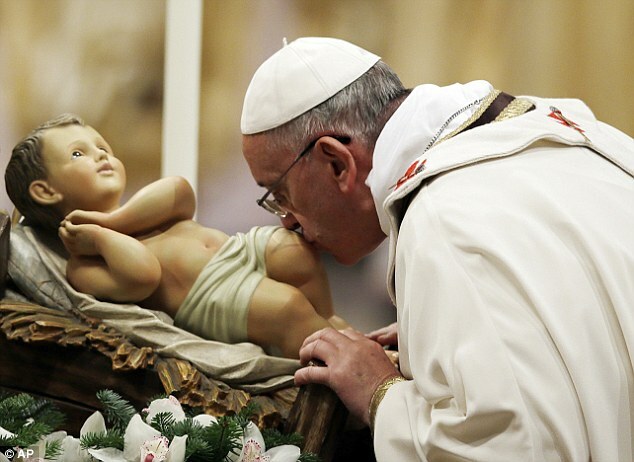 He chose to carry the heavy figurine himself and publicly kissed its knee. 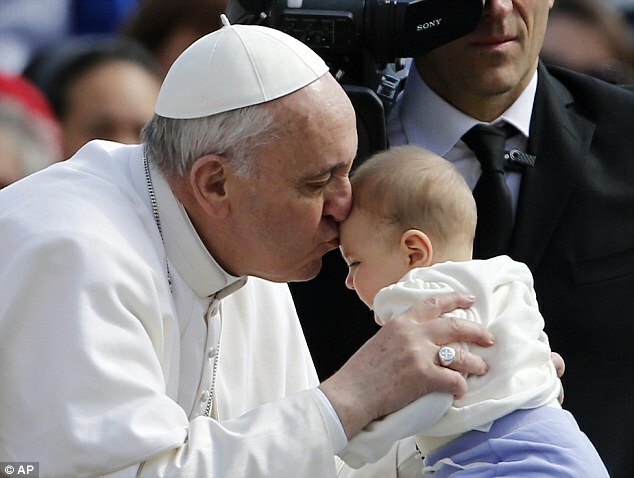 The gesture was all about humility, a theme that has been at the centre of his papacy from the start. On Maundy Thursday, he knelt to wash and kiss the feet of young offenders — two of them girls and one a Muslim — during an Easter visit to a youth detention centre. In July, he invited homeless people to dine with him in St Peter’s Square. 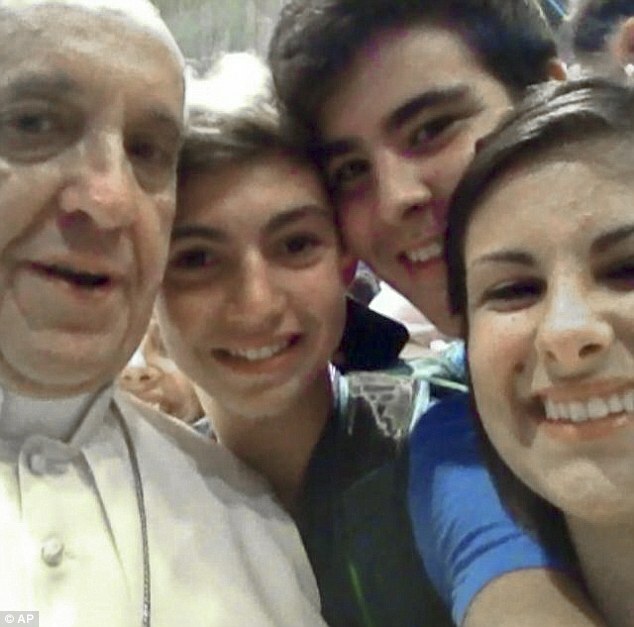 In August, he posed for a ‘papal selfie’ with a group of teenagers. 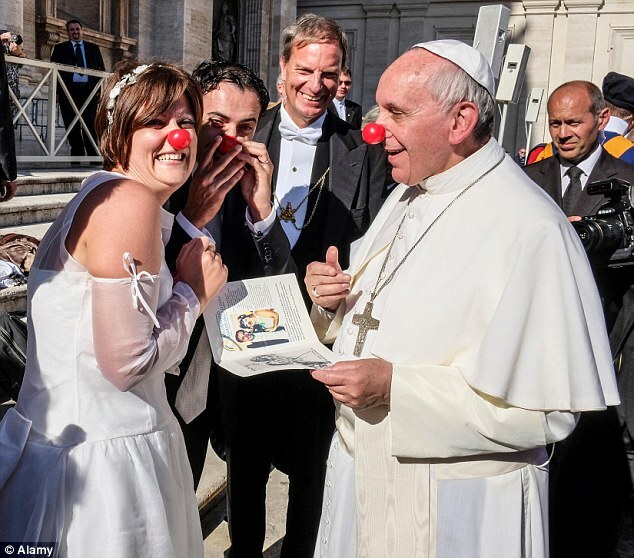 A few weeks later, he put on a red clown’s nose to pose for comic photos with a newly-wed couple. Then, last month, he publicly embraced a 53-year-old sufferer of neurofibromatosis, the rare hereditary disfiguring disease thought to have afflicted the Elephant Man. Images of this heartfelt encounter were beamed around the world. Little wonder they are calling him ‘the people’s pope’. Behind the scenes, the 266th pontiff is defying convention in his private as well as his public life. Indeed, insiders at the Vatican, among whom I recently spent several days, are astonished — and charmed — by the informal nature of his pontificate. Take his domestic arrangements. Unlike his predecessors since time immemorial, Francis has elected to live not in the Vatican’s vast and luxurious papal apartments, but in a simple nearby guesthouse — basically a B&B — called the Casa Santa Marta. He sleeps in a sparsely furnished single room and has breakfast in the canteen alongside fellow guests. He pays his own bills, carries his own suitcases and knows every member of staff by name. He refuses to wear the red hat traditionally used by a pontiff during winter, gold-stitched garments or the scarlet shoes of his predecessors, electing instead to dress in a simple white cassock. Sometimes he is even spotted in black trousers — ‘the height of informality!’ jokes an official. The following day, Francis phoned the man who ran his local news kiosk in Buenos Aires, where he’d been archbishop, and cancelled his newspaper subscription. ‘What you have to remember is that to Catholics, the pope is God’s representative on Earth,’ says another official. ‘He simply isn’t mean to do stuff like this.’ Most mornings, Francis ‘commutes’ to the office on foot, walking through the Vatican gardens. If work takes him further afield, he refuses to travel in a limousine, preferring instead to use a second-hand, navy blue Ford Focus. Recently, Francis shoehorned himself into its back seat for his first state visit, to Italy’s President, Giorgio Napolitano. ‘Usually, a Pope would make these trips in a huge convoy, with motorcycle outriders, ceremonial horses and all that jazz. He flat-out refused,’ says an official. A few weeks ago, Francis noticed that the Swiss Guard outside his guesthouse room had missed breakfast. He went to a kitchenette and made the man a jam sandwich. 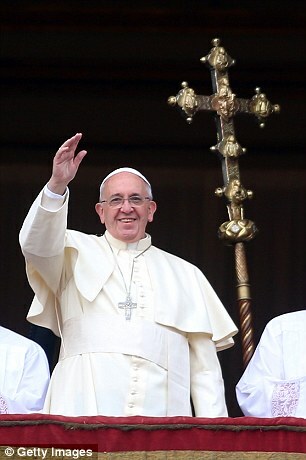 In conversation, Francis refuses to stand on ceremony, calling himself ‘the Bishop of Rome’. At work, he dislikes dictating formal letters, preferring instead to simply pick up the phone. ‘I know of at least one priest who answered his phone and was told “Hi, Pope Francis here,” ’ says the Rev Robert Gahl, a professor at the University of the Holy Cross in Rome. 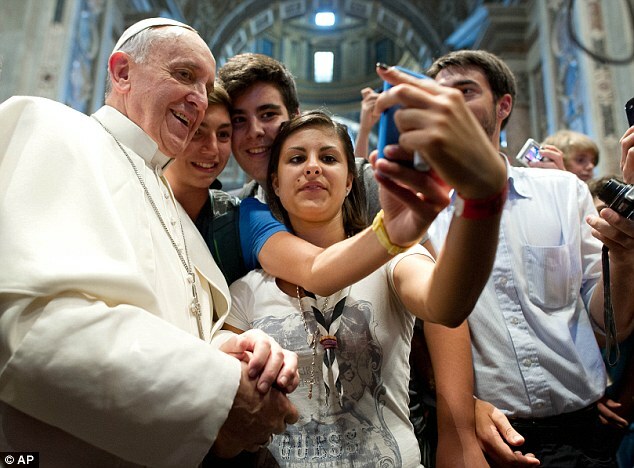 Pope Francis also reaches his public via Twitter, where he has more than ten million followers across several languages. His informal instincts certainly contrast starkly with predecessors, who have sometimes been accused of preaching the joys of foregoing wealth while living like medieval monarchs. The success of this approach is written in numbers. Astonishing, gravity-defying numbers. In Britain, attendances at Catholic cathedrals are up by a reported 20 per cent. In Italy, congregations have grown by a quarter. In his native Argentina, the number of people who define themselves as ‘religious’ rose 12 per cent this year. When Francis visited Brazil this summer, he drew an estimated three million to the Copacabana beach. Twice. Meanwhile, a recent CNN poll suggested three-quarters of American Catholics approve of him — more than for any other religious figure in the world. That seems all the more extraordinary when compared to the Church of England. Anglican congregations fell by 10 per cent in the past decade, prompting the former Archbishop of Canterbury, Lord Carey, to recently declare the institution ‘one generation from extinction’. Yet not everyone is entirely comfortable with Francis’s stratospheric success. In the Roman Curia, the Vatican’s civil service, a few undoubtedly resent having to follow in the footsteps of an ‘austerity pope’. ‘These men have for years enjoyed lavish perks, such as private limousines. Now they feel they can’t enjoy them,’ says one source. In the coming months, in between trips to Israel and the Philippines, Francis has pledged to restructure Vatican bureaucracy and de-centralise power from Rome, potentially threatening jobs. Indeed, I gather that almost all members of the Curia have been told their contracts are to be reviewed in the coming year. Vested interests are threatened by pledges to investigate the child abuse scandal that has tainted the Church in recent years. 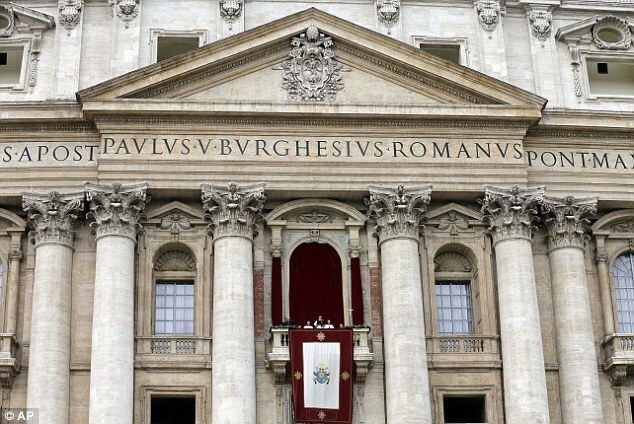 Then there may be fallout from Francis’s efforts to regulate the Vatican Bank following the ‘Vatileaks’ affair, in which documents leaked by Pope Benedict’s butler revealed a hotbed of corruption. 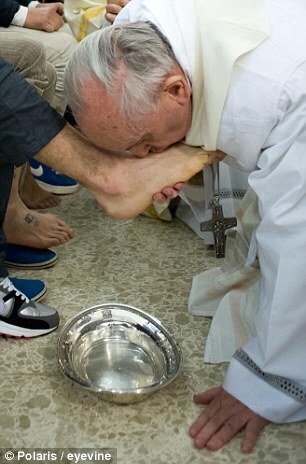 Meanwhile, some Conservative Catholics regard his informal style as disrespectful to the office of God’s Vicar. Others are concerned by rumours that Pope Francis may soften the Church’s line on social issues (in a recent interview, he said he would not ‘judge’ gay people). However, the Church denies any major policy changes on abortion or gay rights are in the pipeline. Though he has called for a ‘more incisive’ female presence in the Church, no informed sources believe Francis is even close to introducing women priests or scrapping laws regarding celibacy in the priesthood. Then there’s the thorny issue of economics. Recently, the Pope — who is supposed to remain above the fray of party politics — has made several speeches attacking modern capitalism, with its alleged ‘idolatory’ of money. Critics have responded that the capitalism he so vigorously attacked has lifted more people out of poverty than any other system invented by mankind. Francis’s stance on the issue remains hugely contentious. In critical circles, many are starting to quietly complain that the Pope’s popularity is more a measure of spin than substance. 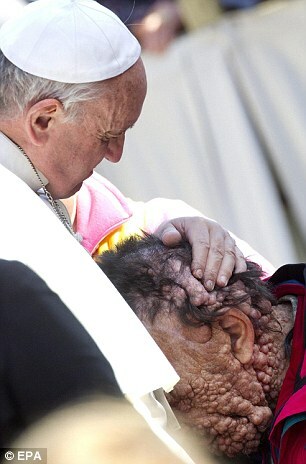 ‘Plenty of popes have embraced deformed people. Benedict did it all the time. 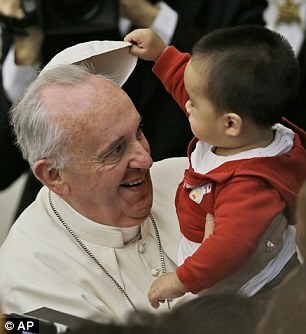 It’s just that he was less good at getting pictures out there,’ one Vatican-based traditionalist told me. Others mutter enviously about the work of Greg Burke, an American former journalist with the Fox News TV channel, who was hired last year as the Vatican’s senior media adviser. Burke partly manages the Pope’s Twitter account and is believed to have overseen such PR offensives as a papal address in March to 6,000 invited journalists. He’s also responsible for Francis having agreed to four interviews so far (his predecessor managed one in eight years). However, a source close to Burke said he ‘would laugh’ if you claimed that the ‘Francis effect’ was down to him. ‘Like any PR man, he says that if the product you are selling is a winner then your job is easy,’ he said. And right now, you don’t have to look far to realise that this Man of the Year is solid gold.